Notre Dame de Paris is the famous historic Roman Catholic Marian cathedral on the Île de la Cité. 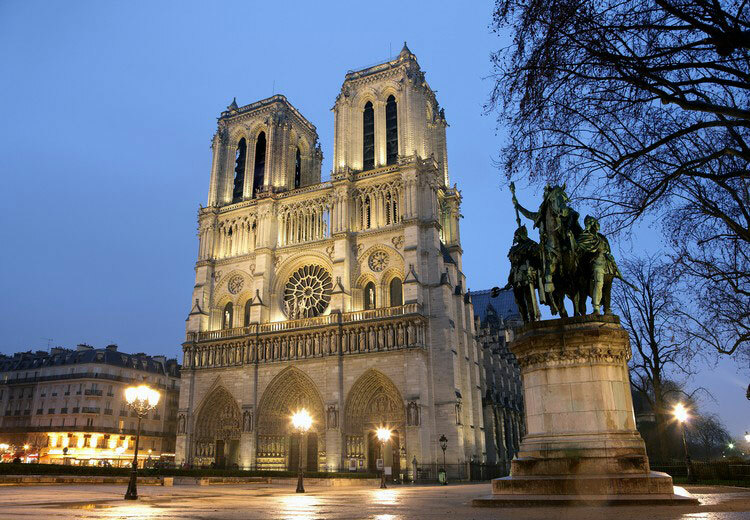 Universaly considered one of the finest examples of French Gothic architecture Notre Dame is the cathedral of the Catholic Archdiocese of Paris; that is, it is the church that contains the official chair of the Archbishop of Paris. The cathedral treasury is notable for its reliquary, which houses the purported crown of thorns, a fragment of the True Cross and one of the Holy Nails – all instruments of the Passion and a few of the most important first-class relics. Bishop Maurice de Sully started the construction in 1163. The Cathedral was to be built in the new gothic style and had to reflect Paris's status as the capital of the Kingdom France. It was the first cathedral built on a monumental scale and became the prototype for future cathedrals in France, like the cathedrals of Amiens, Chartres or Rheims, just to name the most famous. The west front of Notre Dame is a high point of Gothic art for the proportions of its towers, the rose window and the three doorways.